Imagine an alternate universe where some of the world’s greatest literary voices are somehow now involved in the paranormal. This universe comes to life in Emily Dickinson: Paranormal Investigator. Written by Todd Brian Backus, this is a new level of geek theater. Combing an array of styles and inspiration, Emily Dickinson: Paranormal Investigator is a specific world that is a bit messy to the audience. Dramaturgically, there is a giant binder filled with questions and rules that are necessary to define the world that Backus has crafted. Unfortunately, the rules within the play seem to make the most sense to Backus and director Ben Ferber. Aside from the question of linking these literary greats to the paranormal, there seemed to be major plot points missing from this already jam packed sixty minute action-adventure. There just seemed to be so much going on that it’s not a surprise if you get easily confused. Moving forward, clarity will be key to this piece. 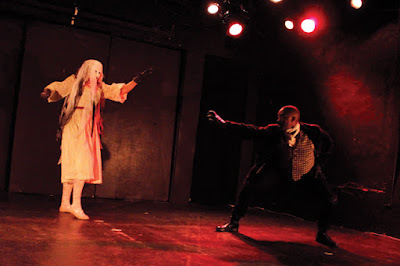 While some of the language that Backus used was slightly shifting, he maintained a consistent Steampunk-like period through costumes, nicely designed by Emily White, and themes. However there was one drastic misdirection when it came to Henry David Thoreau. Backus and Ferber extended time by turning Thoreau into a sideways cap wearing frat boy, equipped with red solo cups. Because this moment was so jarring, it called into question the rest of the world. It was certainly funny, it was just out of place. While Emily Dickinson may have been the titular character, the real star was Marina Shay as Helen Hunt Jackson. Shay has an impeccable approach to comedy. She was engaging narrator and wonderful companion. 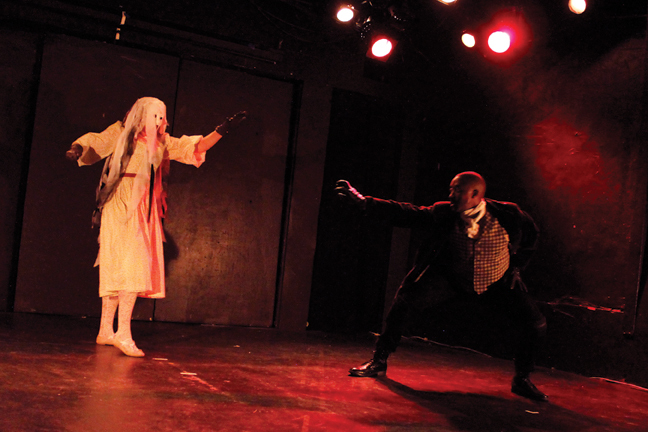 Of the only characters with infamous connection to spirits are the Fox Sisters, the masterminds between all of the paranormal experiences in the play. How Backus and Briana Sakamoto crafted the character was possibly the happiest marriage of the genres. Sakamoto’s small stature turning into the biggest badass on stage was some of the strongest sources of comedy. Taking on the sinister Walt Whitman, Leigh Poulos had fun taking on the evil genius. Likely due to the way they were written, Heather Harvy as Emily Dickinson and Daniel Morgan Shelley as Edgar Allan Poe were quite reserved in their performance. With three actors with high energy, the opposite end of the spectrum didn’t stand out. Director Ben Ferber tried to a lot with this multi-locational play. With every scene being in a new location, Ferber employed a scenic shift after each scene. And the transitions were anything but clean. And it’s never a pretty sight to watch an uncosutmed scene change occur under dialogue. Paring down the movement would have been in Ferber’s favor. Jeff Sherwood had an intricate sound design that was used for the action sequences. And it was a nice element. Emily Dickinson: Paranormal Investigator is a clever idea that needs to be fleshed out. Who knows if the restrictions of the festival were to blame, but there are a number of kinks to be worked out before the next step.